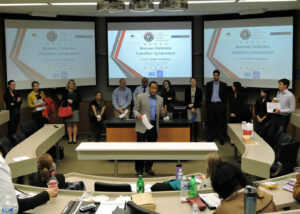 One of the best aspects of Fuqua is the entrepreneurial spirit that exists among the student body. We are quickly entrusted to make this school better than how we found it. Be it through improvements in classes as teacher assistants or the establishment of a new student club, the sky is really the limit to how we can leave our mark on this institution. 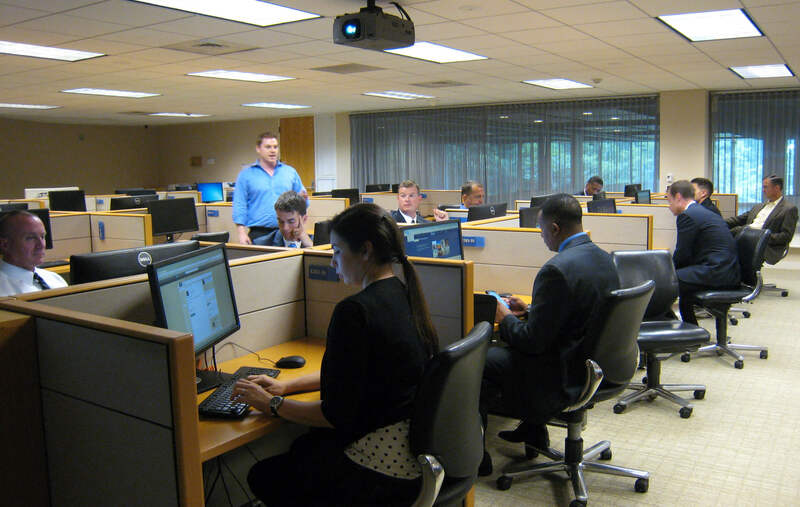 My classmates Kevin Brilliant and Herman Bulls identified a gap for a growing segment of the U.S. population: veterans transitioning out of the military who did not feel prepared to effectively or successfully navigate the job market. To that end, they founded the Fuqua Initiative for Veteran Employment, or F.I.V.E. STAR Transitions (FIVE STAR), to assist those veterans and to continue Duke University’s strong history of supporting the military. 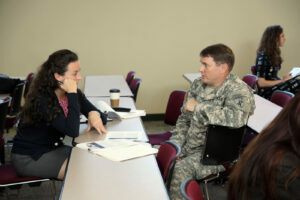 As veterans of U.S. Army Special Operations, my wife and I quickly realized the potential for such an organization and have been actively involved with their transition education events. 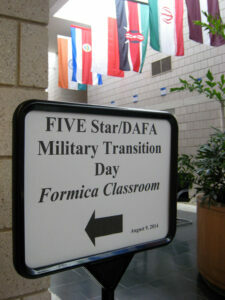 I asked Herman and Kevin about their work founding FIVE STAR and the support Fuqua provided. Paul: What made each of you want to become involved with veteran issues? Herman: I’m an active duty U.S. Army Captain, and during my 10 years of service I have frequently seen soldiers leave without a sound plan. They get a solid job lined up back home, but one that may not tap into the many unique technical and leadership skills they can offer the workforce. Kevin: I don’t have any direct links to the military, however I went through a challenging career transition where I left the only profession I’d known to pursue something different. I felt I could relate to the uncertainty and doubt that transitioning veterans face. During mine, I relied heavily on others for their support and guidance, and I wanted to help empower transitioning veterans by giving them access to the same types of resources. 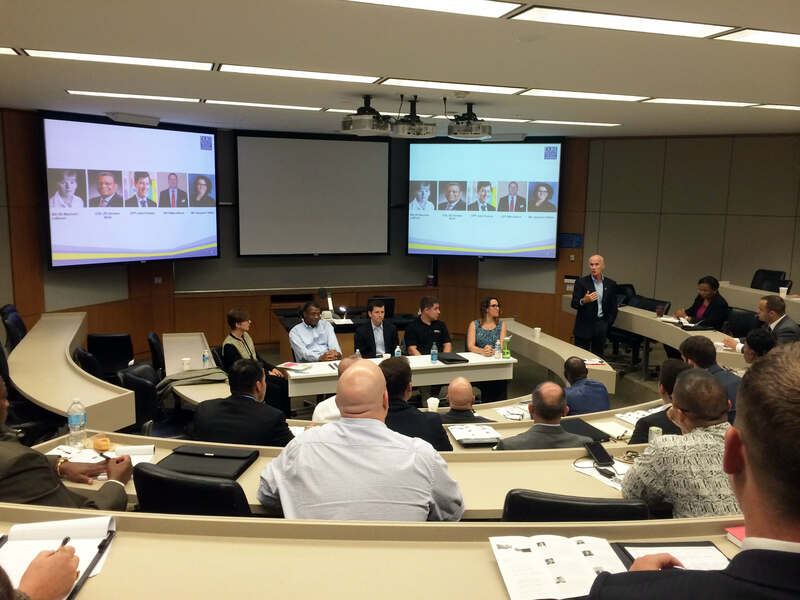 Paul: How do you think Fuqua supported your entrepreneurial vision for the organization? Herman: The Fuqua administration and students have been 100% supportive of us starting this organization. 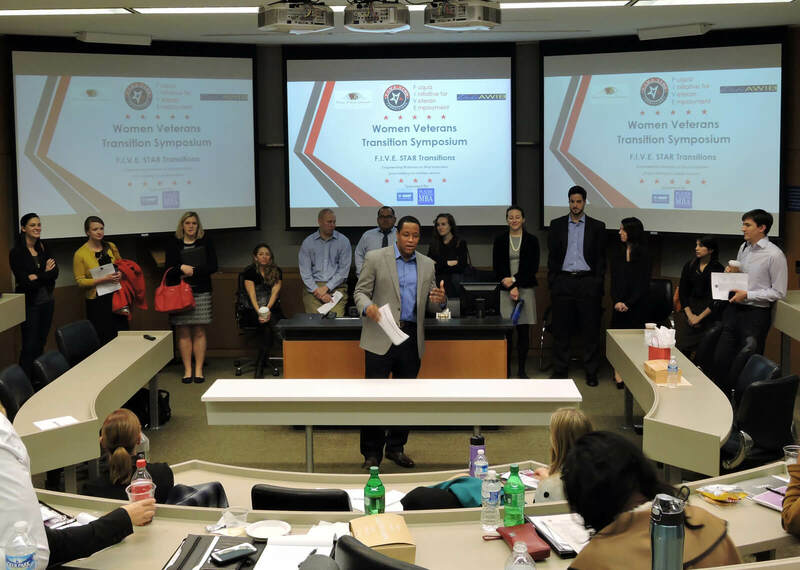 We had faculty dedicate countless hours to speaking with us about the initiative and many volunteering to participate in the veteran symposiums we have put together. We never had an issue finding students who would dedicate their time to either travel to nearby Fort Bragg (one of the largest military bases in the world), conduct mock interviews with soldiers, or help with our events. We even had amazing Fuqua partners that have joined the FIVE STAR team in volunteer capacities or in full time leadership roles. While other business schools could try to put together a program like this, I don’t believe they have the same supportive ambition that Fuqua does, which is key to the operation. Kevin: We’ve felt from day one that Fuqua is the perfect place for this program. The community has rallied behind this initiative, which isn’t surprising given the growing and impactful presence that veterans have on campus through the Duke Armed Forces Association (DAFA). Duke has made an authentic commitment to veterans in a way that differentiates it from other top universities. Paul: When making your decision to attend business school, did you think you would have the time to work on a venture such as this? Herman: No. I knew I wanted to work with the admissions department and teach undergraduate Reserve Officers’ Training Corps (ROTC). To that, add the academic workload, having two kids born while I was at Fuqua plus other activities and clubs in which I wanted to be involved. I figured I wouldn’t have time for anything else. Additionally, I had never started an organization from scratch. The idea of starting something new was intimidating to me but it was the supportive environment that Fuqua provides that made me realize this was something Kevin and I could do and excel at. Kevin: I came to Fuqua with the broad concept that would become FIVE STAR, so for me not doing it was never an option. There are only so many times that the merits and ingenuity of an idea marry perfectly with the conditions in which you find yourself, and this was one of those times. Finding Herman as a co-founder was the single-most important thing that happened along the way. Without him, there’s no way the organization would be where it is, and it’s possible that it would never have gotten off the ground at all. Paul: What were the biggest challenges you faced in starting this organization? Herman: Putting on events. Because we are not technically a Fuqua club, we did not have access to certain fundraising options that clubs normally do. For our first few events, Kevin and I paid for all expenses out of pocket, but we knew that wasn’t sustainable. So we began to partner with other Fuqua clubs which allowed us to fundraise for events and be able to provide veteran participants with a more enriched experience. Through the supportive ambition of our classmates we were able to overcome this challenge and allow FIVE STAR to grow. Kevin: Getting the word out to potential participants in the transitioning veteran community has been difficult. Right now in America there are so many veteran assistance organizations that it’s confusing; instead of using a lot of services, transitioning veterans end up using none. That’s an uphill battle we’ve had to face, and even with the reviews that we’ve gotten from our participants, which have been extraordinary, it’s still a challenge. At our last event, a Marine told us that she’d spent the first half of the event wondering what was in it for us; when she discovered that we just wanted to help, she was blown away. Paul: What can future classes of students expect from FIVE STAR, and what challenges will they face? Herman: The biggest challenge will be building out the organizational structure to allow it to be sustained going forward. At times over the past two years, the organization only existed through will and effort from Kevin, myself and the core leadership team we had in place. Though our passion for seeing this organization grow was successful in getting us to this point, that will not be enough going forward. We addressed this issue by getting a strong leadership group for next year together. Anne Wu and Susan Whitmer, the Class of 2016 students who will be leading FIVE STAR into its next phase, have already done a great job executing an event we had in April. We have also worked out a permanent partnership with DAFA that will allow the two organizations to share synergies. Kevin: FIVE STAR has a lot of good things going for it, not the least of which is the strong cabinet Herman mentioned. They will face the challenge of continuing to build momentum while innovating. Running FIVE STAR requires a lot of work and dedication, but seeing positive results for the veterans we assist helps to stoke the collective passion of everyone involved in the cause. Paul: Any words of wisdom for future students who might want to leave a legacy at Fuqua? Herman: Regardless of who you are, do not sell yourself short. Embrace your entrepreneurial spirit, and don’t be afraid of doing something new. I never thought I would be able to start an organization from scratch during my MBA experience, let alone one that has made this kind of impact. My work with FIVE STAR has made me realize that, just like the veterans we worked with, I have more to offer in my career as an Army officer and beyond than I used to think. Kevin: There’s a difference in life between ‘enthusiasm’ and ‘passion.’ Enthusiasm can be temporary, fleeting, and in the moment. Passion persists. It allows you to overcome obstacles and push through challenges. Find something about which you are truly passionate: your work, your life, and the people around you will be better for it.